Pamela Dodds: In my practice I explore the complexities of human relationships. I create from a feminist, lesbian sensibility that listens to, embraces and explores the inter-connectedness of humanity across time and space. Women and women’s agency are central to my imagery and ideas. In relief print media of linocut and woodcut, I create imagery where the gesture of the human form, when mirrored or counterpointed within an expressive environment, can describe a complex and layered moment. I find meaning in the pairing of figures, whether to represent an intimate exchange between individuals, or the shared experience of a multitude. The suites of prints are created in narrative sequence and each print can be read independently, or as a part of a whole. The imagery for Undertow arrived through my musings on the subject of saving and being saved. This can be interpreted literally, as a story about someone drowning in the water, or figuratively. I wanted to explore the inherent imbalances in a rescuer-rescuee relationship. I wondered about the possibility of one’s desire to rescue being greater than another’s desire to be rescued; or about a moment when a rescuer might want to succumb – to be willingly pulled below the surface – by the other; or about a choice to let go; or, the letting go when there is no choice. The prints are created through multiple printings of layers of ink on a manual etching press. The water imagery is printed from the natural wood grain pattern of long boards. The figure imagery is carved in relief in separate wood or linoleum blocks and then registered and printed into to water/wood grain patterns. Pamela Dodds is a visual artist and printmaker. She was born in Halifax, Nova Scotia, Canada, and grew up in Toronto. She received an Honors B.A. in Fine Arts from Brandeis University, Massachusetts, continued to live for many years in the USA, and returned to Toronto in 2007. 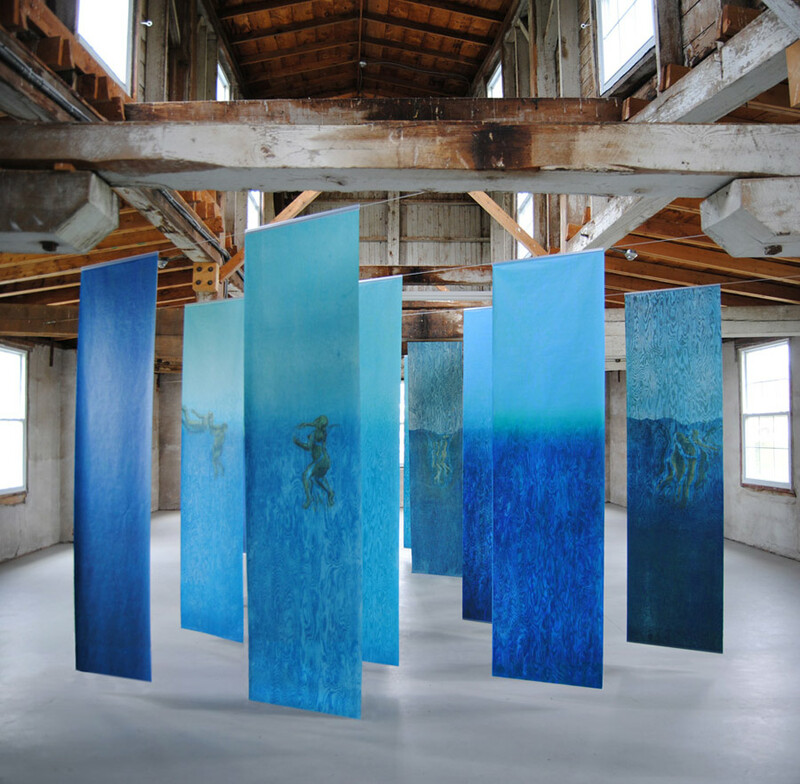 Pamela’s artworks have been exhibited in numerous exhibitions in the USA and Canada, including solo exhibitions at William Busta Gallery, Cleveland, Ohio (2009, ‘11, ‘14); Open Studio Printmaking Centre, Toronto (2009, ‘14); Visual Arts Centre of Clarington, Ontario (2017). She was feature artist at Lesbian ARTivisms in the Age of Globalization Colloquium, University of Ottawa (2016). Her work has been purchased for collections of Purdue University, Illinois; Boston Public Library, Massachusetts; Cleveland Museum of Art, Ohio; Carleton University, Ottawa, and many individuals.